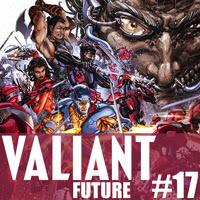 Due to an aggressive allergic reaction to goats, Adam has left Joe and Paul to fend for themselves as they discuss the latest and greatest from Valiant Entertainment. Watch out! They have red eyes like a bunny! Valiant Future - Unity #4, X-O Manowar #22, Unity #5, Quantum and Woody #8, Quantum and Woody: Goat #0, Bloodshot and the HARDCorps #19, Bloodshot and the HARDCorps: HardCorps #0, Archer and Armstrong #18, and Bloodshot and the HARDCorps #20.